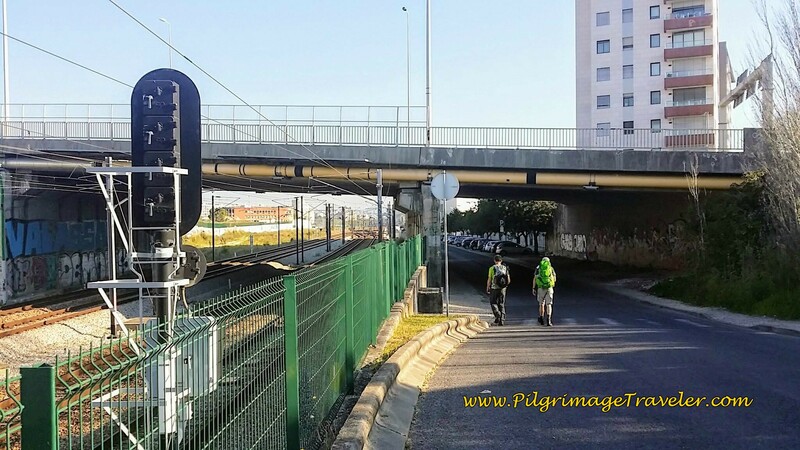 A lot has been said, mostly negative, about day one on the Camino Portugués and walking out of Lisbon. I was even advised to skip this part entirely, by many pilgrims. I was told it is ugly and too industrial. 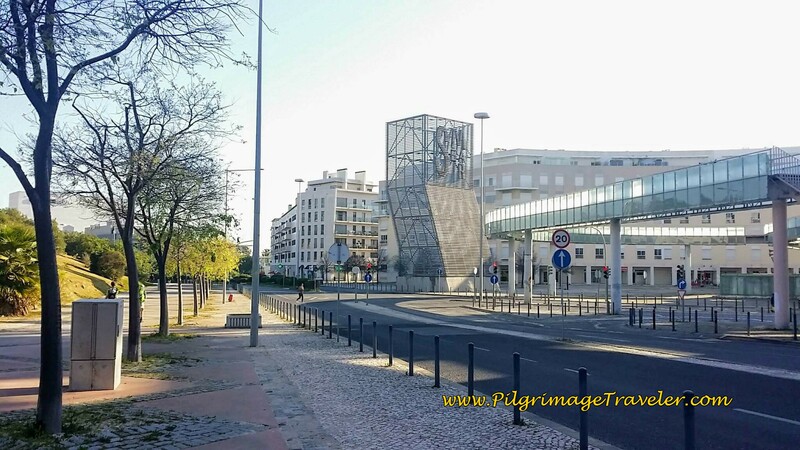 I was told not to start the Camino Portugués in Lisbon, but in Fátima: It is much nicer. I did not heed their advice, but wanted to see for myself! And I am glad I did. I am not sure why the first day on the Camino Portugués has received such a bad reputation. My experience of it was nothing like I was warned about, and aside from the length, I loved it! 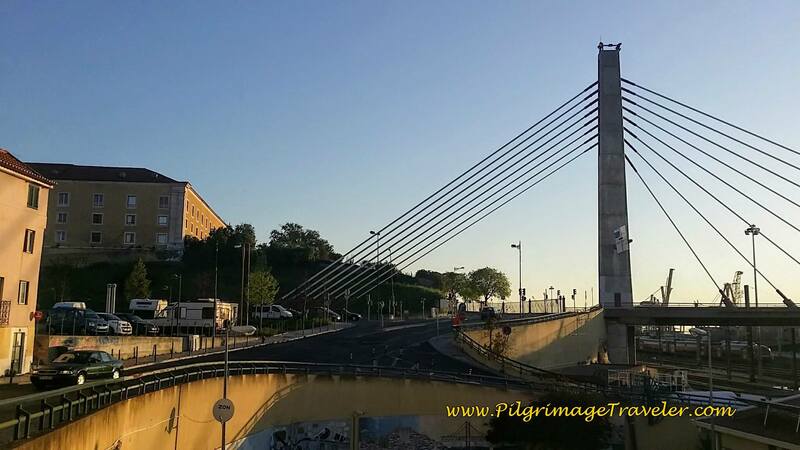 By viewing our experience of Day One on the Camino Portugués, below, I hope to dispel the myth about this part of the Camino, once and for all! You may judge for yourself, like I did. Here is my Geotracked google map, and elevation maps, directly from the Geotracker app on my android device. I took the liberty to also map the albergues, hotels and restaurants that I entered or passed by. I hope you find this information useful. You can see the elevation changes below. The stats on the top are from the 22.77 km section from the Cathedral of Lisbon, to the albergue in Alpriate. The stats on the bottom are for the final 10 km from Alpriate to where I stopped recording in Alverca do Ribatejo. While the charts above look dramatic, it is truly just little ups and down of 100 feet (30 meters) or so. A word of warning to the Pilgrimage Traveler, regarding the waymarking. 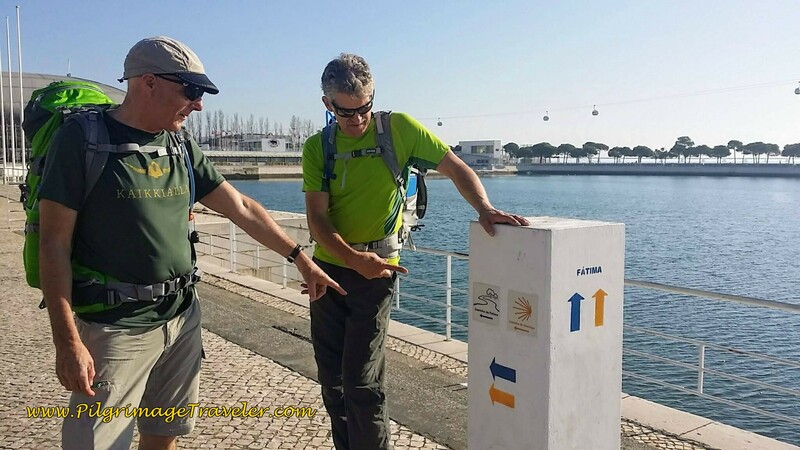 It is not always easy to find the yellow arrows on the way out of Lisbon. You have to be especially alert and look on electrical boxes, the backs of street signposts and along the curb at the level of the street. 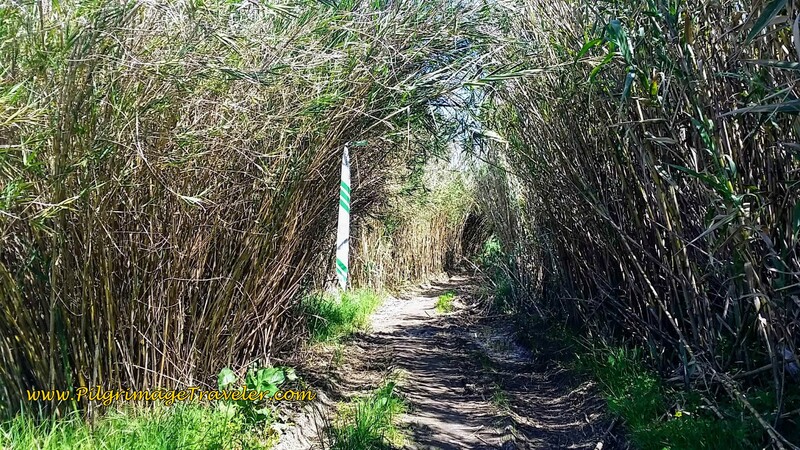 The arrows are often small, but often accompanied by the blue Fátima arrows, which share the Camino de Santiago route. Even though the arrows are there, they are often difficult to see. What can I say? I have included a lot of photos in this day's article. If you want to be surprised, don't look at the photos. I promise, that I am depicting the route as I saw it, the good, the bad and the ugly. While I have included the photos of our journey in this article, if you would like to see the mapped route with our photos superimposed, click this link. This will bring a whole new dimension to the route. 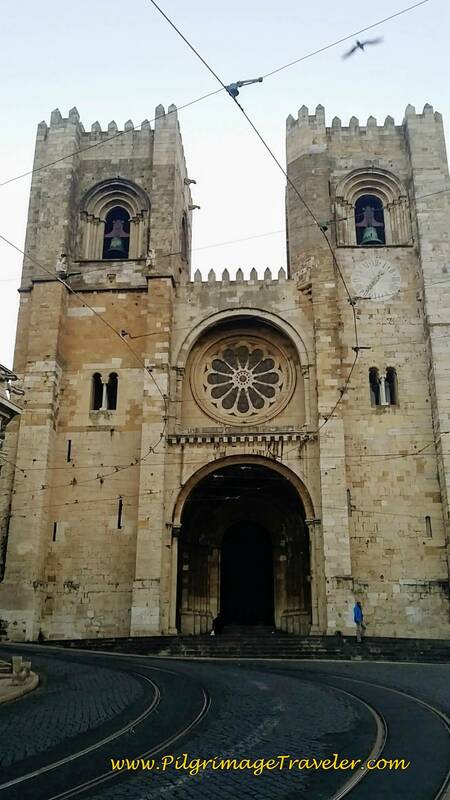 Our tale of Day One on the Camino Portugués begins with a seven a.m. start at the cathedral in Lisbon. We had walked from the official start at the Igreja de Santiago, just up the hill on the day before. It was a perfect spring morning in early April! In the early morning hours, very few were stirring, neither natives nor tourists. The crazy crowded entrance to the grand cathedral was replaced by stillness and silence. I was able to snap the photo, below, amazingly unobstructed by anything, save for one lone man by the right of the door, in a blue jacket. He is barely visible on the photo. As it turns out, this solitary gentleman was hanging out in front of the cathedral, in order to hook up with other pilgrims. As we approached he asked if he could join us. We said, yes, of course. We quickly struck up a conversation with our new friend from Switzerland, and off we went, through the quiet streets of the Alfama district. That's our new Swiss friend and my husband, Rich, in the photos to follow. 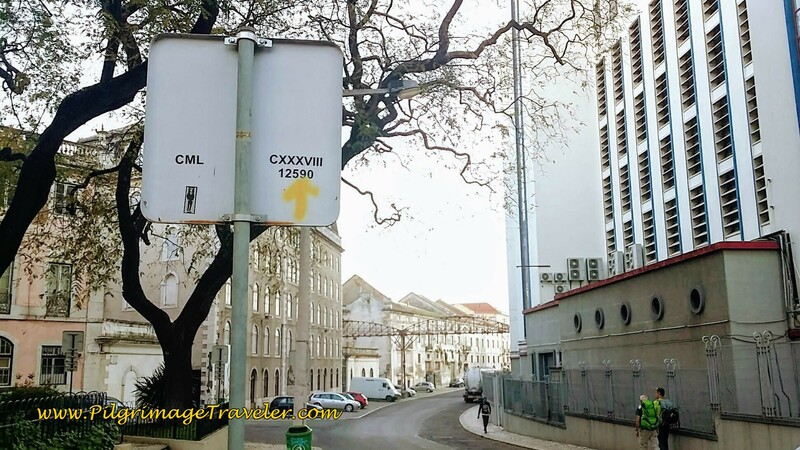 The Portuguese Way takes you around to the right of the cathedral door, marked by a yellow arrow. See my official start page if you want photos and a description of the beginning steps from the cathedral. 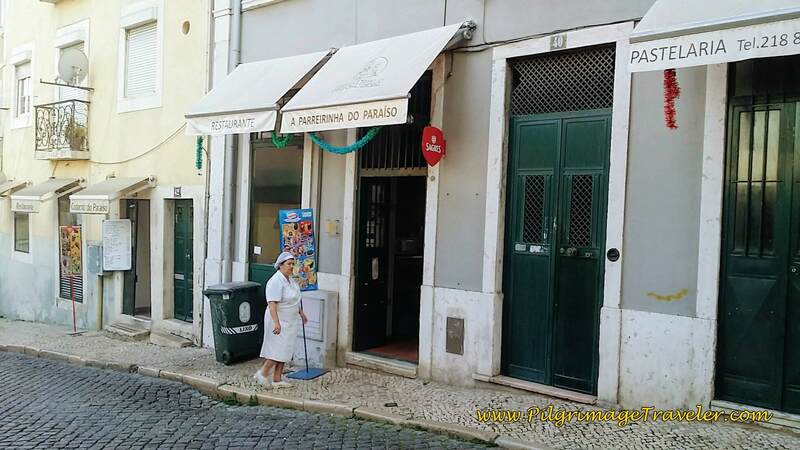 If we had not already had a bite to eat, we would have stopped at the pastelaria, farther along on the Rua do Paraíso where an early worker is already on the clock. 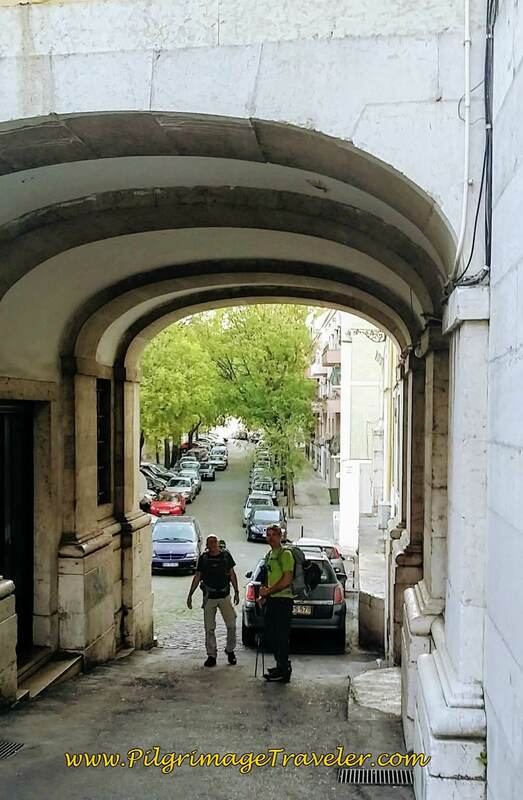 We continued along the Rua do Paraíso under this interesting architectural archway. As we walked we chatted with our new Swiss friend. As synchronicity meets us often in our lives, this man had just celebrated his 61st birthday the previous day. He was the same age as Rich. Additionally, his son is 30 years old, and Rich also has a 30 year old son. Incredible! Significance? Who knows! Interesting nonetheless. 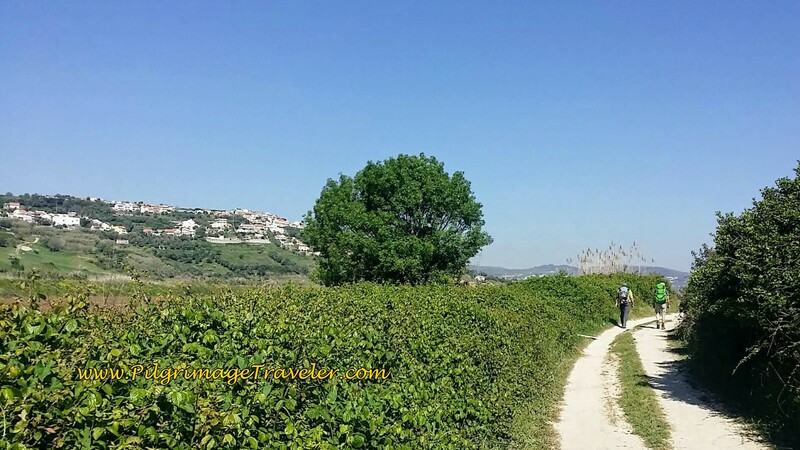 We were meant to walk together, I suppose, on this day one of our Camino Portugués. 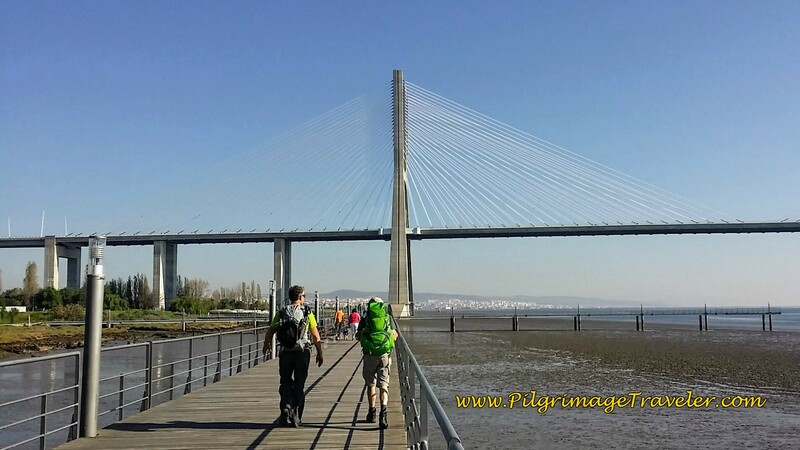 After several kilometers, the route follows the train tracks that run parallel to the docks of the Rio Tejo (AKA Tagus River in English), that can be seen to the right in the next photos. The early morning light cast a wonderful glow on the Rua de Santa Apolónia and the bridge ahead. We had a bit of a hill climb along the railroad tracks, after passing the bridge. If this is what the naysayers meant by the "industrial" areas, I found it to be quite nice in the glow of the morning light. 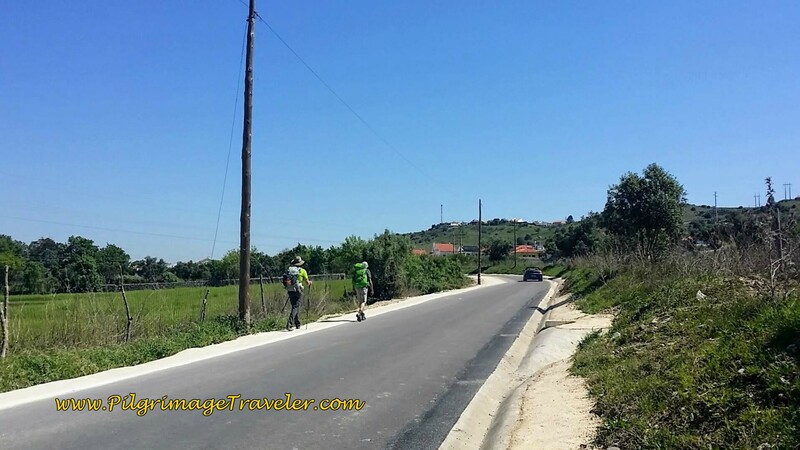 We skipped along the cobblestone sidewalks on the Calçada da Cruz da Pedra. I snapped a picture of Rich. The streets, framed by bright spring green leaves and interesting buildings, kept the route far from boring and industrial, as we passed by. Maybe not so interesting a section below, but the ugly, high walls shielded the railroad tracks and the docks from view. The cobblestone everywhere is quite charming as well. 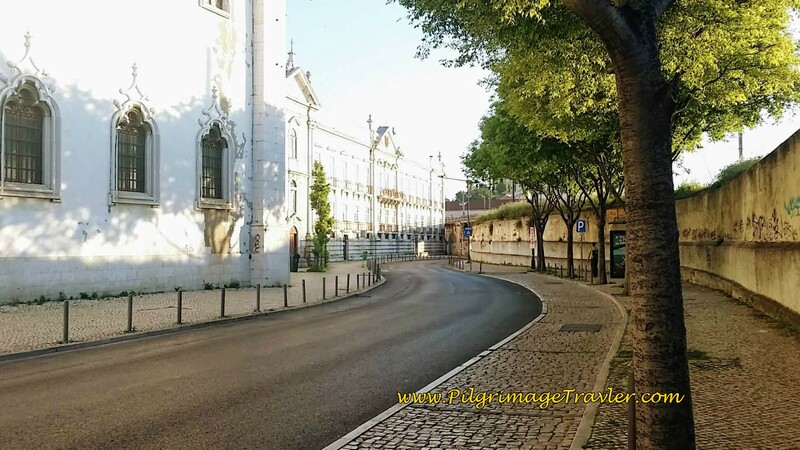 At about three kilometers into the day we walked past the Museu National do Azulejos, or the National Museum for the famous Portuguese blue tiles. Unfortunately, on this trip, we were not able to see this famous tourist site. Farther along on the Rua do Beato, I photographed this street signpost with the yellow arrow. While visible, one doesn't see it until quite close, as the arrow is small. At about 5 kilometers on day one of the Camino Portugués, the Way walks through this lovely plaza, or praça as it is known. I wished I could linger and mill about as these folks were doing. It was too early in the day for a coffee break. At about 6.5 km and several hours into our journey, we did stop at the Restaurant Bar Tofa (not pictured, but located on the map above), on the Rua Vale Formoso for our second breakfast. It was a perfectly located restaurant along the Camino where we had delicious ham croissant sandwiches and café con leite (coffee with milk). 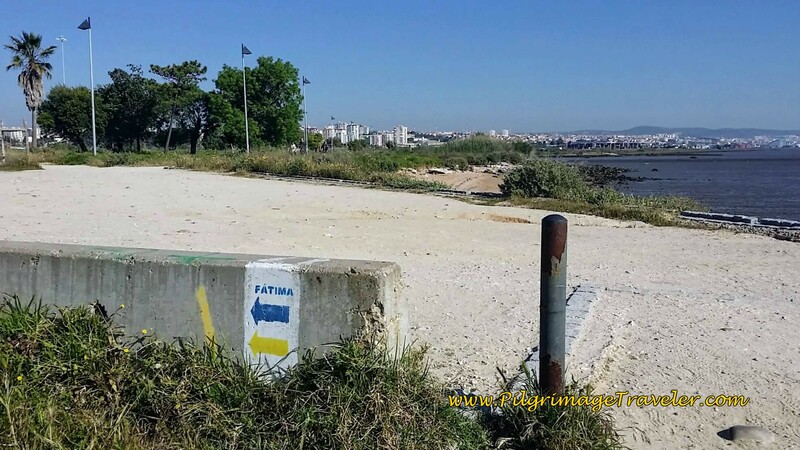 From the hill climb on the Rua Val Formoso, the road then descends and turns back toward the River Tagus (Tejo in Portuguese) and the 1998 World Expo Site. In the next photos, you can see the road and sidewalks widen and you are nearing the Expo site, with buildings that provide an interesting backdrop! Turning onto the Alameda dos Oceanos, you enter the world expo site, with it's gumby-like greeter in the circle. This is the mascot of the expo named "Gil." Welcome to the World Expo! 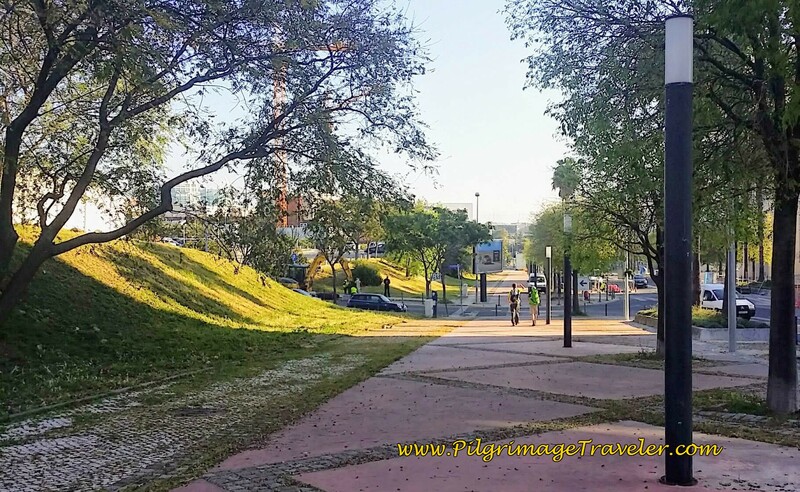 The Camino walks through the Expo site, now called the Park of Nations or Parque das Nações. It soon diverts to the riverfront as seen in the next photo. 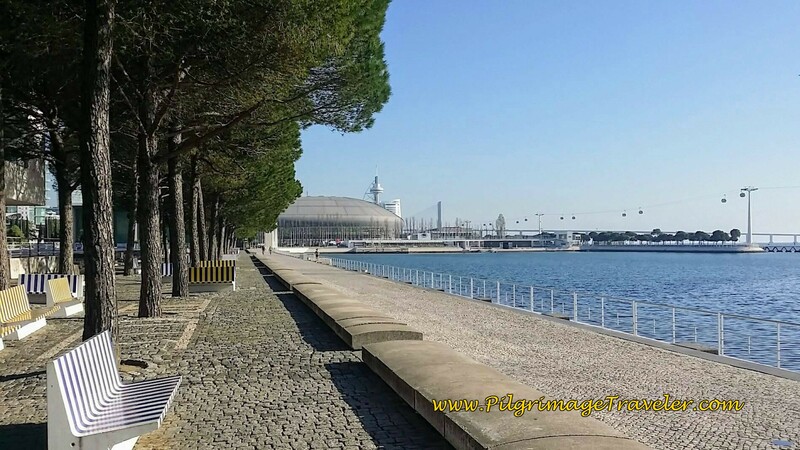 This promenade shown below is an amazing waterfront walkway called the Cais Português that is extremely popular with the locals, and shows the wonders that were created for the World Expo. Walking along this promenade was pleasant indeed, and with a nice cool breeze! Here is a photo of the MEO Arena in the distance, an exhibit hall converted into a multi-purpose arena. Here is our Swiss friend, and my husband, Rich, pointing to one of the many new and visible Camino markers in this area. Turning right onto the Rossio dos Olivais, you walk by the flags in the Park of Nations. Looking back over your shoulder is the huge Centro Vasco de Gama, an exhibit hall turned into a giant shopping complex. 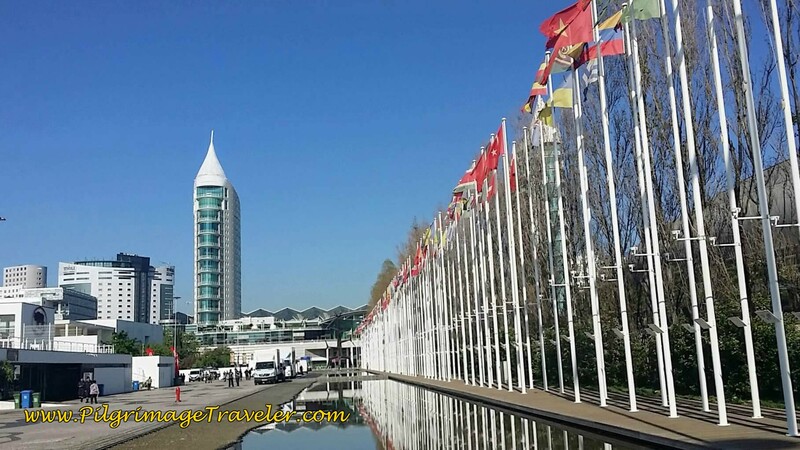 I loved this part of day one on the Camino Portugués and wished I had more time to explore this amazing Expo site. 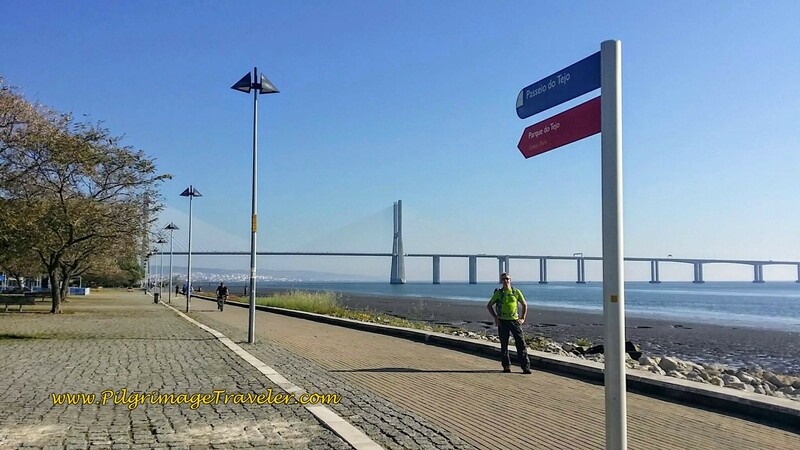 Turning left onto another promenade, one walks along the Passeio do Tejo, shown below, where the Vasco de Gama bridge first comes into focus. 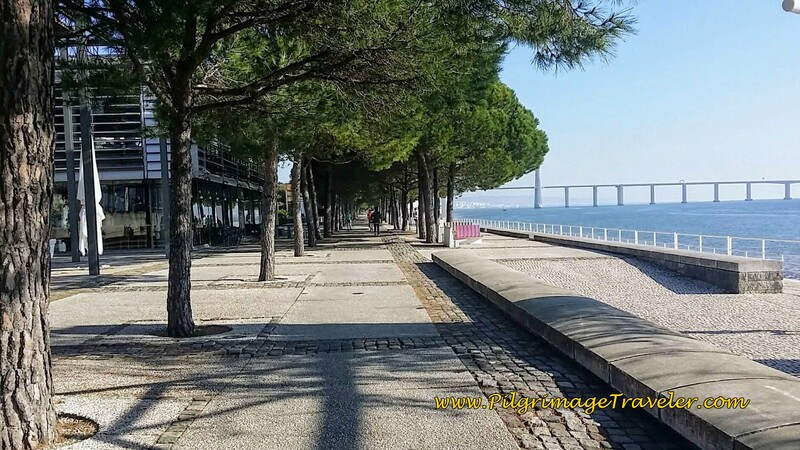 This is a lovely shady walk along the Tagus River. 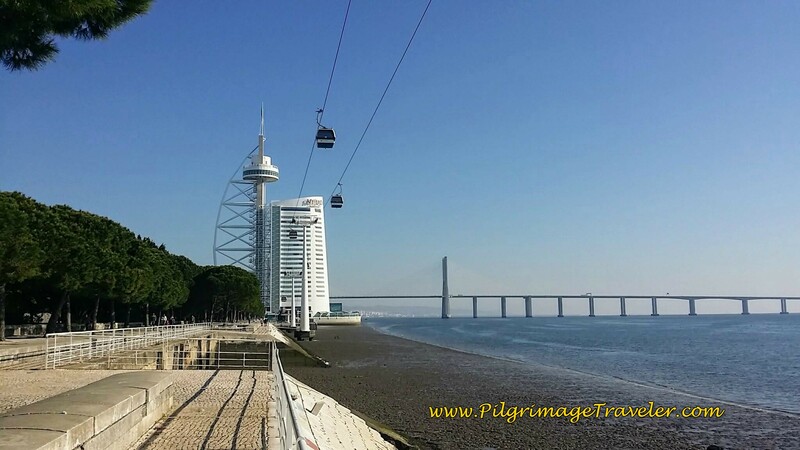 Farther along the Passeio do Tejo, and under the cable car, the grand Vasco de Gama Tower is your next destination. Beyond the Tower, the Ponte (bridge) Vasco de Gama gets ever closer. Here is Rich under the sign that says "Passeio do Tejo." Rich and our Swiss friend closing in on the Vasco de Gama bridge, on a nice boardwalk that relieved our feet of hard surfaces for awhile. 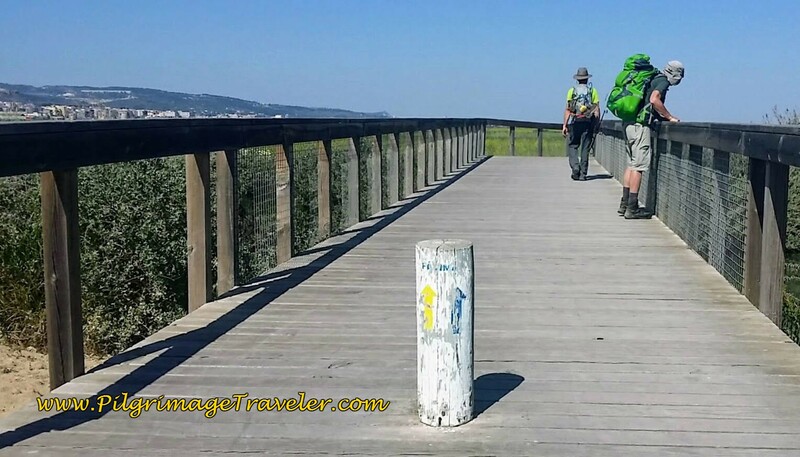 Until the boardwalk suddenly ends and turns abruptly inland at the waymark below, at just under 12 kilometers into day one of the Camino Portugués. 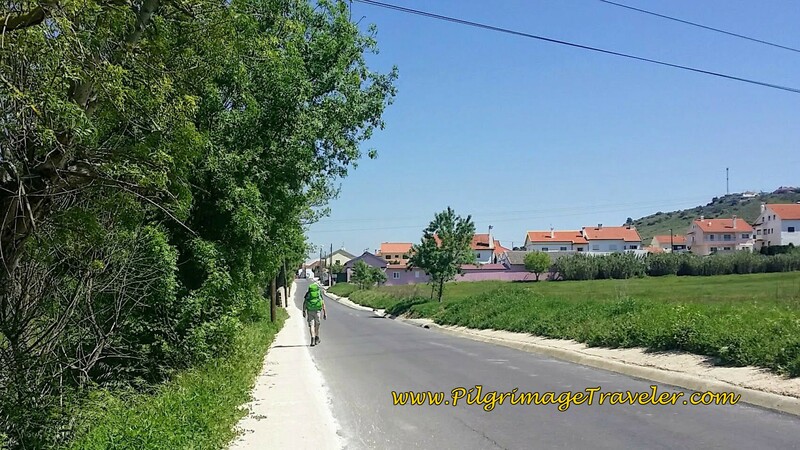 The path now skirts the town of Sacavém to the north. You are more than halfway to Alpriate at this point. 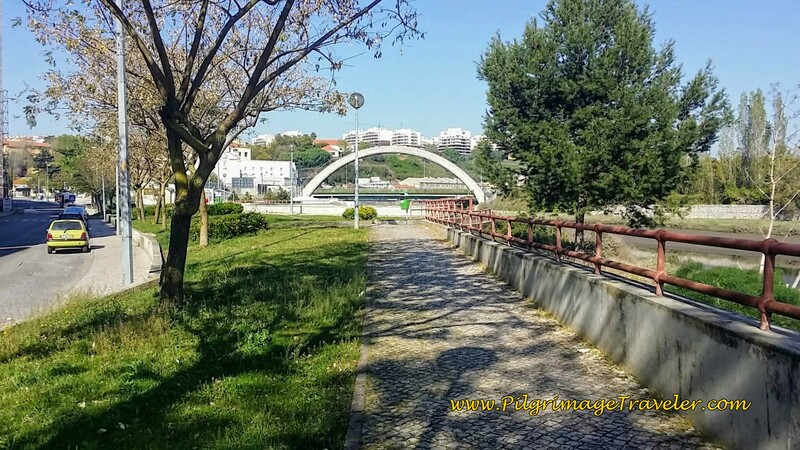 The Camino joins the street, or Rua, below as it follows the Rio Trancão, as it heads toward this archway across the river. In a short distance after the archway, the Camino crosses the N10. After crossing the N10, the Way immediately turns onto the path shown below. Look closely for the turn. It is easy to miss, as we almost did! This interesting path in the middle of the town of Sacavém is welcome after the many cobblestone paths we just walked. It follows the River for a long ways. 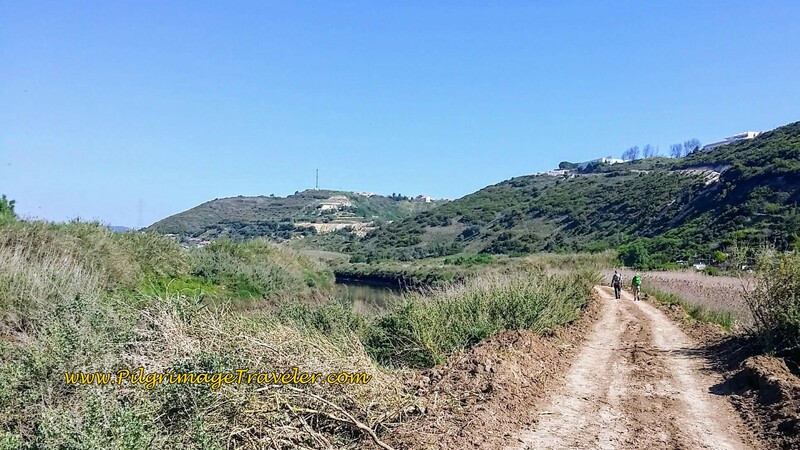 This section of the Camino was very exposed, hot and dry, so be prepared! The path leaves the canal and walks through open fields that were a bit more lush. 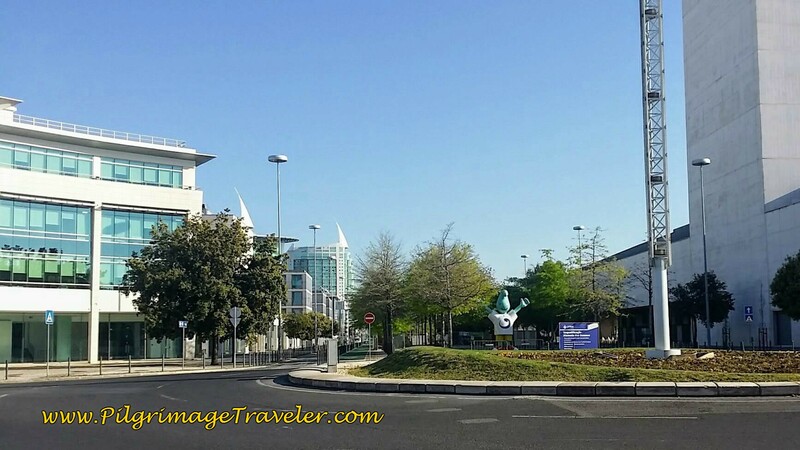 The flight path from the the Lisbon airport is directly overhead, and we saw many a plane flying from the west to the east as we walked through this area. The track turns into a dirt road, then eventually joins the Caminho de Fátima, shown below. The sun was quite hot. I had indigestion, most probably due to dehydration, so I forced myself to drink more of the warm water from my hydration pack. It was now also three and a half hours since we ate at the 6.5 km mark, so hunger may have also played a part. I carried on. The red roofs of Alpriate ahead, were a welcome sight. Right in the center of this little town, you immediately see the albergue on your right. 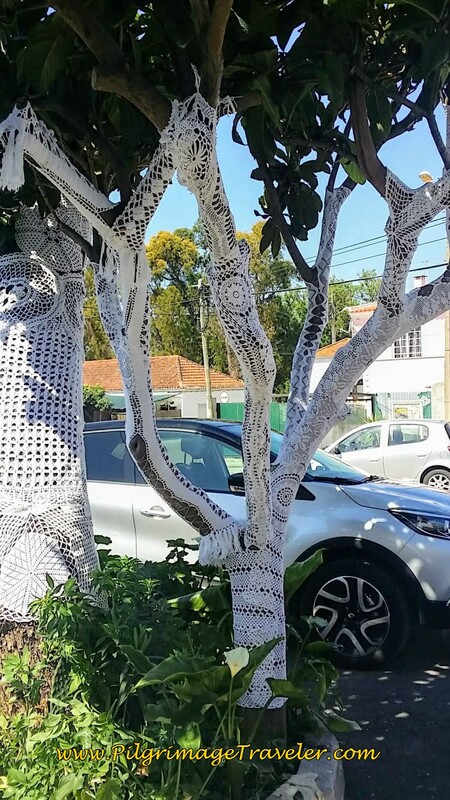 This interesting tree decoration is right by the albergue. Just Look for the Adorned Trees! A very helpful townsman was standing by the albergue, directing us to the town café, which is just around the corner to the right from the albergue, called the Snack Bar Grillus. We thanked the man and immediately went to the café for lunch. The Swiss man and my husband quickly killed two beers to my one. I needed more water than beer. While we sat in the shade under the outdoor awning, I aired out my feet which were surprisingly good after 22.77 km. However, my hips, knees and shins felt like I'd had enough! Rich and I decided to have lunch, but after drinking two beers, our Swiss friend declared,""I'm not hungry." When the bread and olives arrived prior to our entrees, I offered some to our Swiss friend. I just can't eat in front of someone who is not. He proceeded to help himself to generous amounts of the food. I couldn't tell if he really was not hungry after three hours walking, or cheap, or just afraid of the unfamiliar menu? Regardless, I couldn't help raising my radar over his "lack of hunger." 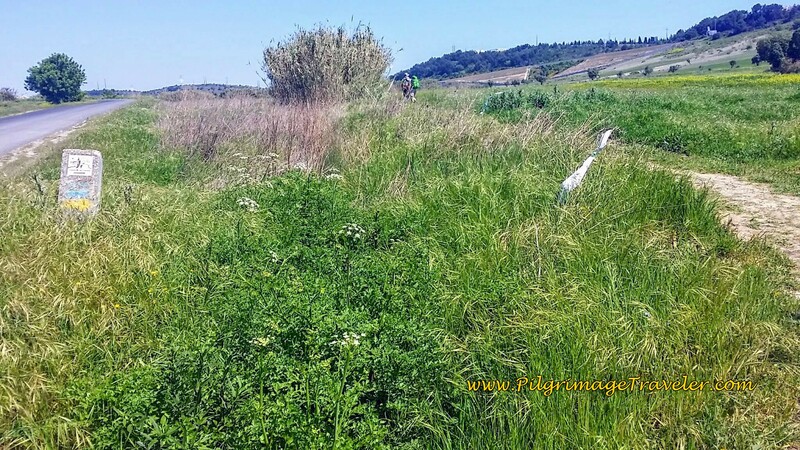 We decided that after the long rest, we would push on to Alverca do Ribatejo, the end of the standard stage for day one on the Camino Portugués. Since I had planned for us to stay in Alpriate, I had no real plan for the next stop. I quickly checked the guide I was using and thought I'd google an albergue when we got to Alverca. First mistake! 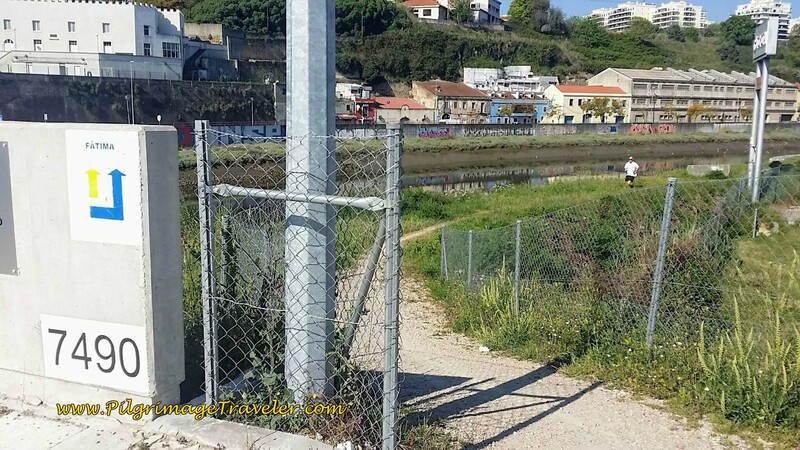 This turned out to be a hard lesson that I hadn't yet learned for the Camino Portugués. One must plan ahead on this Camino or face the consequences. I turned on my Geotracker. 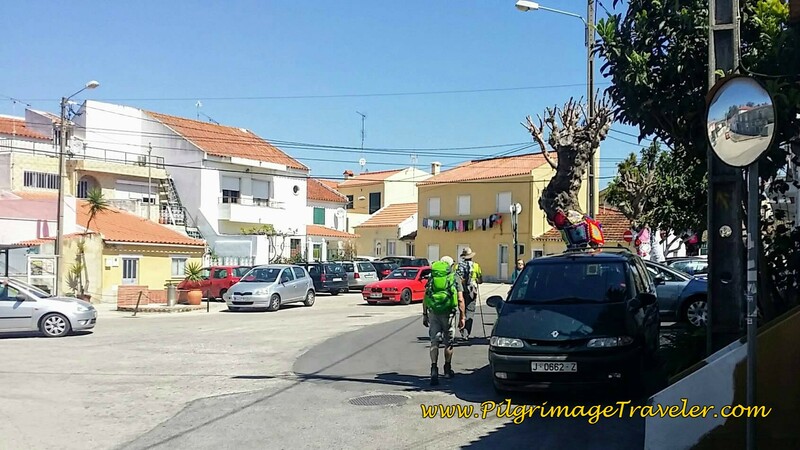 We threw on our shoes and packs and set off for Alverca do Ribatejo. So far we had not met any other pilgrims that day. We caught a glimpse of a young pilgrim man leaving Alpriate just before we were leaving. However, we were not to see him again! If not for our Swiss companion, we would have had a lonely walk. It was good to chat with him along the Way. 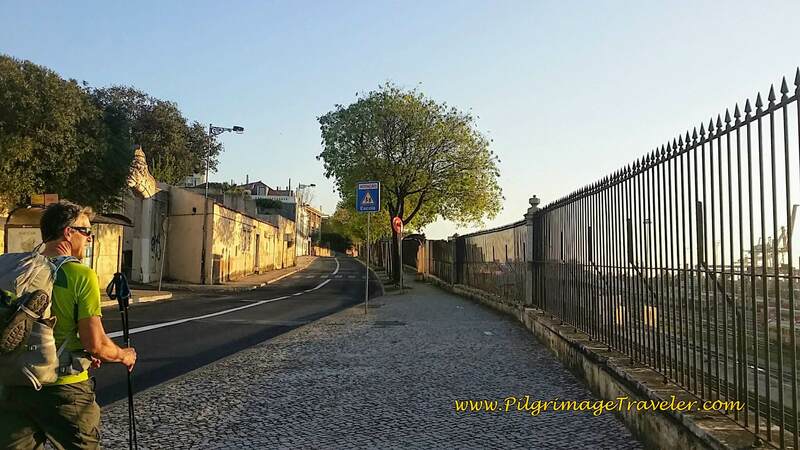 Walking out of the town square on the Rua da Vinha, one soon turns right onto this wonderful footpath, below, to continue onward. 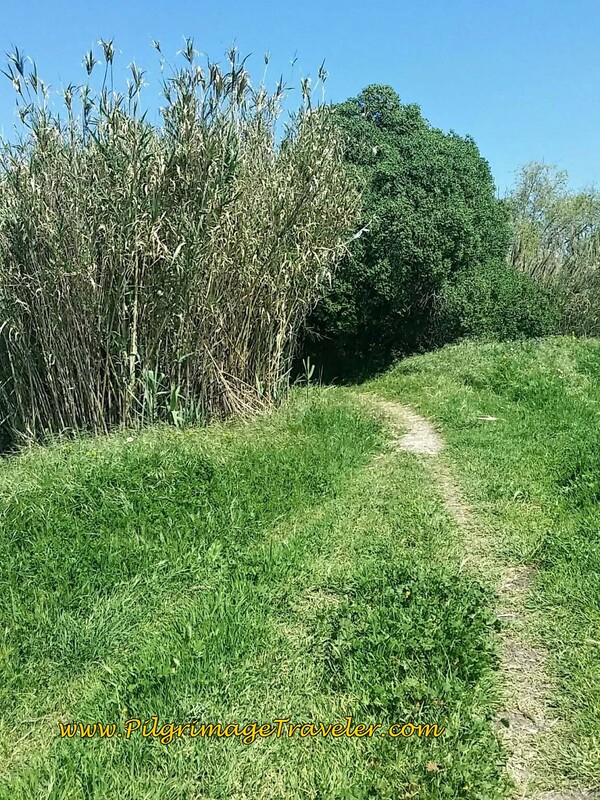 The path became kind of marshy, as it entered this willow-like grassland. I thought it looked a bit like bamboo? If any one knows what this plant is, please contact us and let us know! The sight of the willows were an interesting diversion as we walked, not to mention how grateful we were for the shade! We turned briefly onto a paved road, but then left again on yet another nice long path. No shade here! 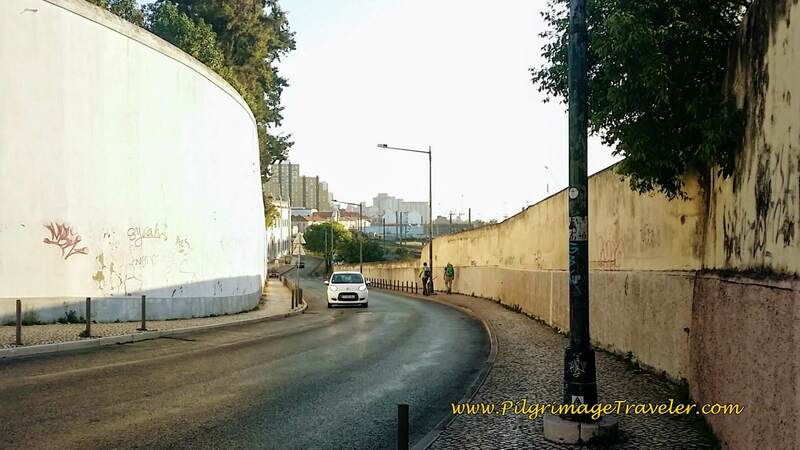 Just after this nice path, when we were walking down a busy street without a shoulder in Soda Póvoa (not pictured), I swear a young male driver swerved his car toward us like he was going to hit us, then at the last minute swerved away! Ah, the Portuguese drivers! A good reason to walk facing traffic! I was about to jump into the bank! 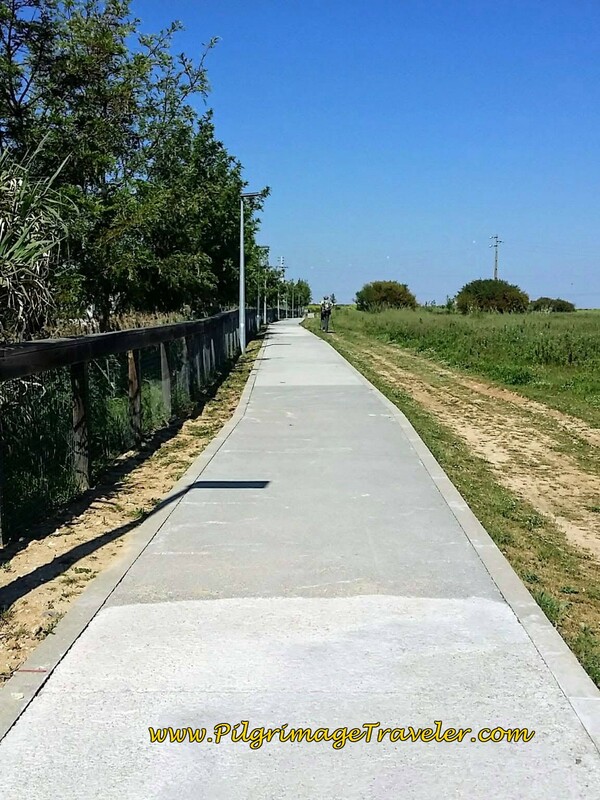 Fortunately the Way soon diverted to this nice concrete pedestrian path, that led once again to the waterfront and another boardwalk. 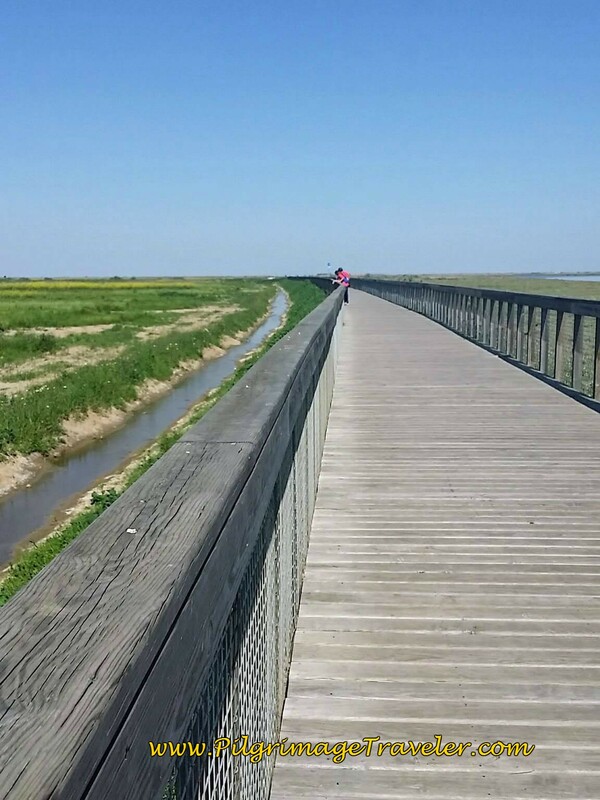 This unnamed boardwalk path begins at the Praia dos Pescadores, or the "Fisherman's Beach." 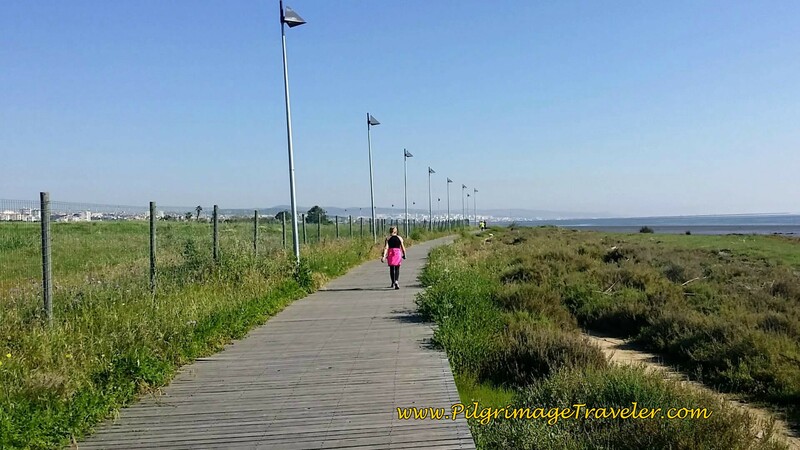 The boardwalk goes on for a nice distance, before the Way again veers off the waterfront, to the left and onto a longer dirt path into Alverca do Ribatejo. After our long dirt path, we zig zag here and there and eventually rejoin the railroad tracks on our left. The dirt path gives way to a quiet paved road as it follows the railroad tracks into town. We kept on the Camino until the railroad station in Alverca, which was our second mistake. 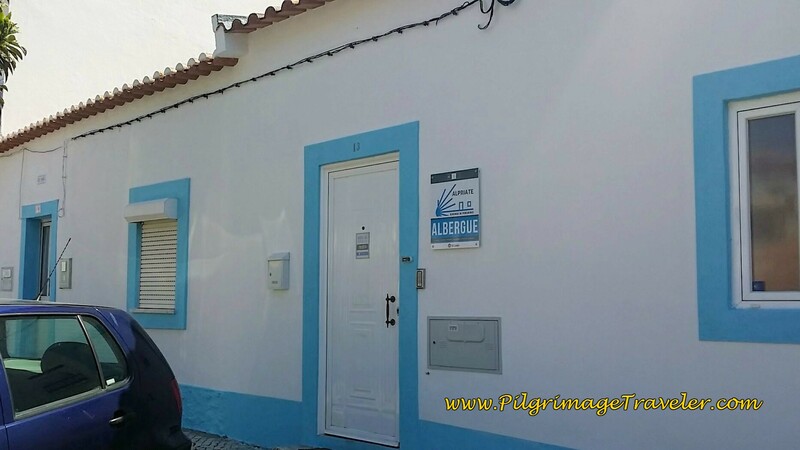 Our third mistake was having insufficient information on an albergue which I was trying to locate in Alverca called the Fundação CEBI. This albergue was listed in our guide, but not on the accommodation guide file. I wasn't worried because the guide I was using was reputable and well-known. 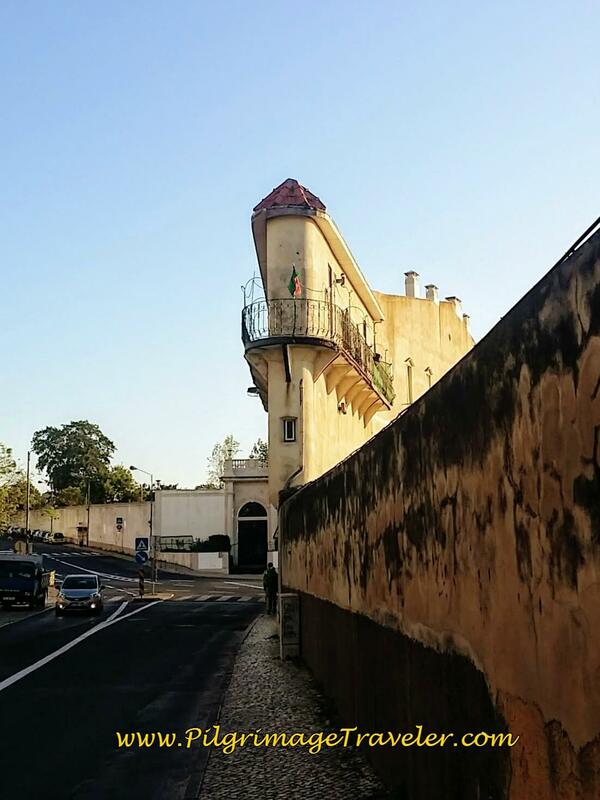 We crossed the railroad tracks in a funky glass building with stairs and elevators, and stopped on the other side of the tracks to Google the address of the Albergue Fundação CEBI. Where the Camino turned away from the directions to the albergue, I stopped recording our tracks, as you can see by my map above. We were unable to find the albergue, despite the google directions, so we proceeded to ask a local. We gave her the street and she was so willing to help, despite her inability to locate the place either! 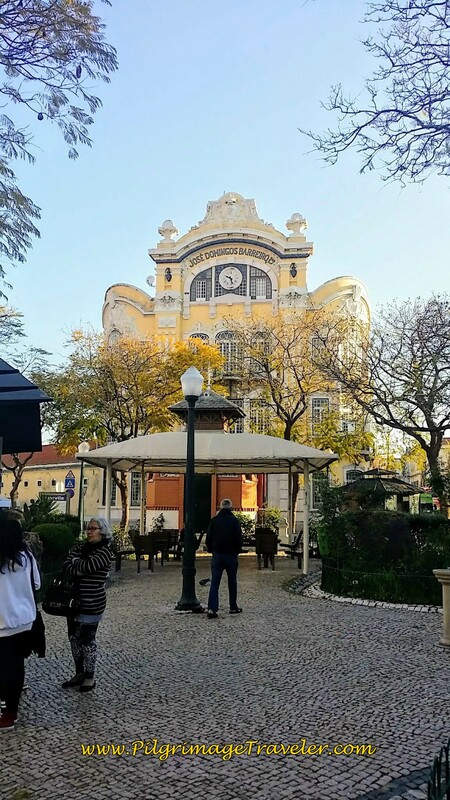 After wandering about town a bit, we grew frustrated, released our Portuguese guide and being so tired, we sat down on a curb, by a cafe, and tried to pool our resources. It was six o'clock in the evening, and something had to be done soon. I was preparing to sleep outdoors in a park bench! I asked our Swiss friend to help me and please look in his German guide book. He dutifully tried to find information, then shook his head and handed me his book! As if I could read German! Both gentlemen were looking to me to solve the problem! I finally recalled the Via Lusitana SOS line that I knew about, looked up the number I had added to my contact list before leaving for Portugal and called it. What I was told by the helpful English-speaking person is that the Albergue Fundação CEBI is open only by reservation and never on weekends. It was Saturday!! Ay! She also stated that there are NO other accommodations AT ALL in Alverca, no hotels, no nothing, despite the fact that Alverca is a sizable town! I couldn't believe it when she said we must go forward to Vila Franca de Xira, another 10 km or so, OR backward to Verdelha. OMG! When I told the guys what the SOS person said, our Swiss friend was a bit miffed, and said "I never go backwards!" Not a helpful spirit. I certainly was not going to walk forward another 10 km! The park bench was looking more and more inviting. 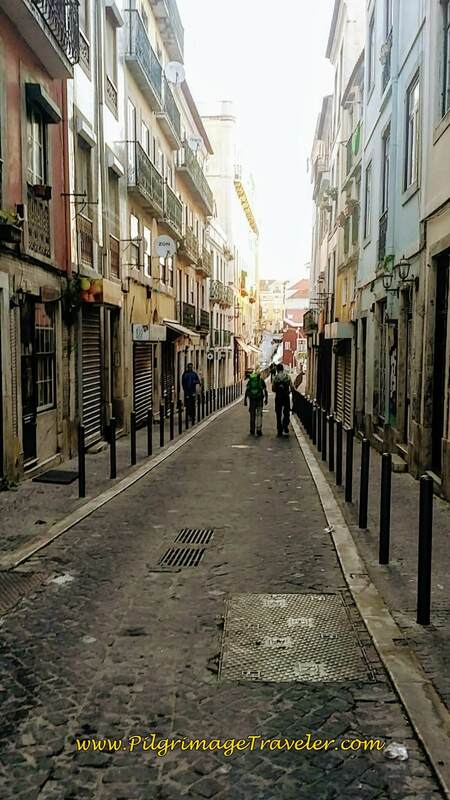 As we were sitting on the curb on the side of the street, frantically searching our books for a solution, a young Portuguese man approached us and said "You look like you need help." We said, "Yes!" and told him we were looking for accommodation. I started to daydream of a private home sofa and/or floor. Much better than a park bench! He immediately explained to us where to go to find two places to sleep, only about 1 kilometer away. In his broken English, and my broken Spanish, we managed to communicate. although his directions were difficult to follow. Finally, I pulled out my cell phone and google maps, and he showed us where to go! 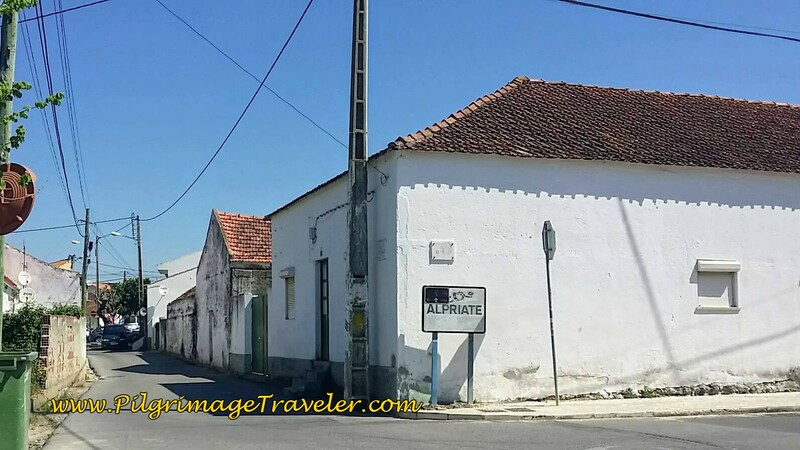 We we so close to the Estrada da Alfarrobeira (name of the road) where there are three accommodations in that "town that started with a V!" We had no idea that we were so close to Verdelha, and needed to "go backwards" less than one kilometer at the most. Turns out that when we were looking for the albergue CEBI, we were actually heading back in the direction of Verdelha! Hallelujah! What a relief! Tragedy averted! A Camino Angel had arrived at our most desperate moment! Even our Swiss friend was happy with the solution, and tagged along as we went "backward" to Verdelha and the Estrada da Alfarrobeira. Thank God for this wonderful, wonderful young Portuguese man. Our Angel indeed. I was saying many, many prayers of gratitude as we walked toward Verdelha. 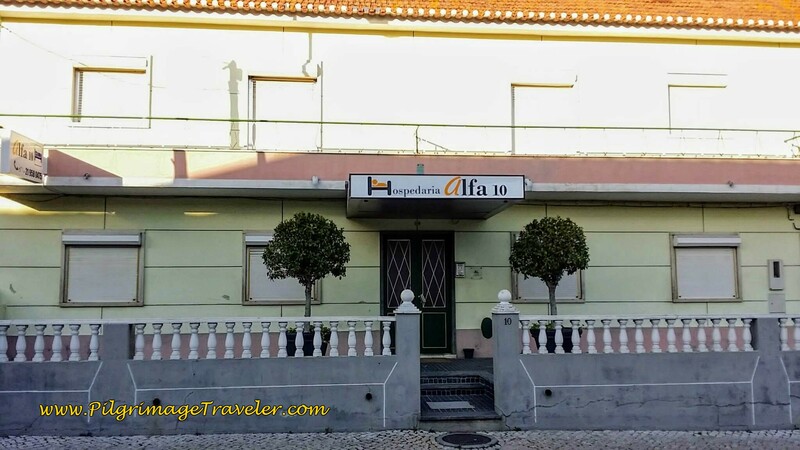 The first accommodation we came to on the corner of the Estrada da Alfarrobeira was the Faia, restaurant and dormidas. We rang the doorbell to the office, but no one answered. I suppose it was not yet high season for the Camino. I was going to call the number on the door, when I saw the Alfa 10 just up the road. It looked like a hotel. For only 15 E each at the Alfa 10, we were thrilled to secure two nice, small and clean hotel rooms. No one actually there but us! Wow! Everyone was now happy, me the most! Our Swiss friend arrived later to our room with beers for all. He'd had almost no food on our day one on the Camino Portugués. Maybe beer is indeed his number one guest?? Just beyond the Alfa 10 we could see a bustling eatery. It was the Cafeteria and Restaurant, Segafredo A Lantera, also with Dormidas, or rooms. (219 576 488. This place is not on the accommodation guide.) After showering and washing our clothes, we had a delicious fish dinner here. Back in the room for the night, my throat was sore and my hips were aching. I had absolutely no idea how I was going to get up again the next day and do another ridiculous 30 kilometers! I made a note to myself that I absolutely had to plan better for the next day. I confirmed the extra mileage later, when the Alfa 10 hotel owner gave us a little map, for the morning, on how to rejoin the Camino in Alverca. 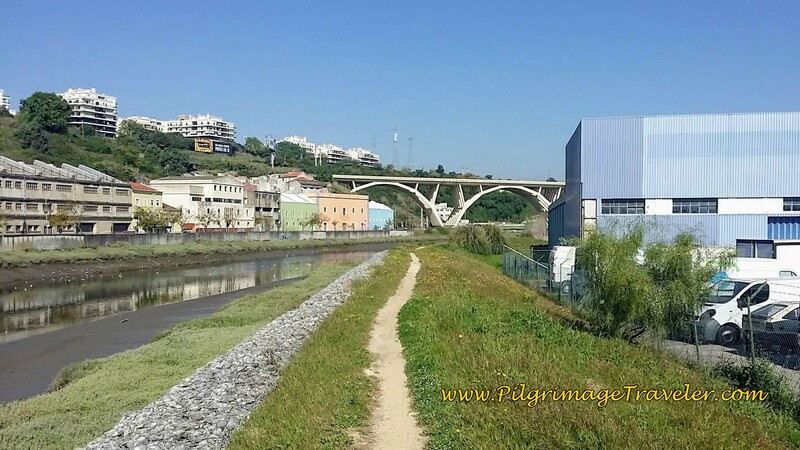 It showed that it was 1.5 km from the Alverca train station to the Alfa 10, for an additional 3 km round trip from where I had stopped geotracking. The second leg was at least 11.5 km, for a total of 34.72 kilomenters we did for the day! 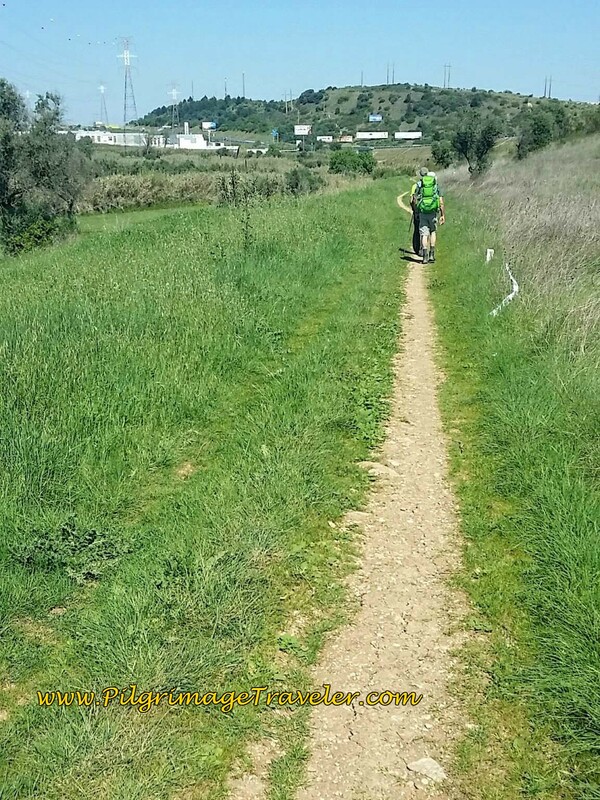 If you plan to reach Alverca on your own day one of the Camino Portugués, I have included the shortcut to Verdelha that we should have taken, on my map above. 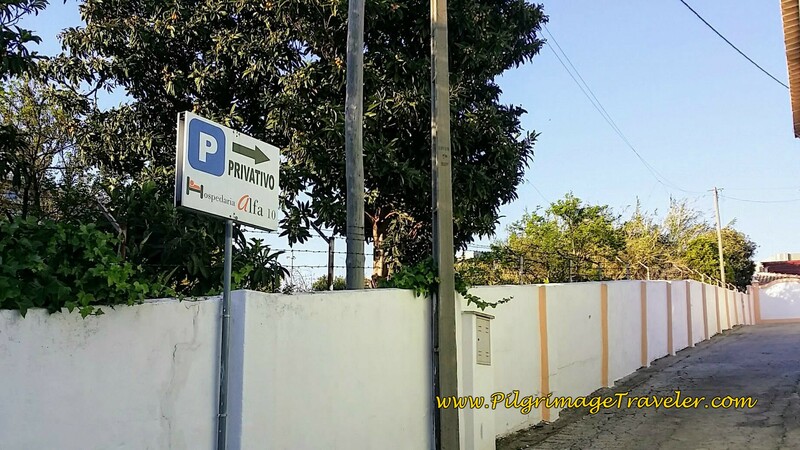 I suggest you stay in Verdelha and avoid any trouble and confusion like we had to endure! Just refer to my map at the beginning of the article, and look at the way to walk from the railroad tracks to Verdelha. It is so easy! If only I had paid attention! Plan, plan, plan! If I had only looked more carefully at the information I already had, we could have cut off at least 4 or more kilometers from our day's journey. As per the Rumi quote above, the new arrival in my human house was a large dose of humble pie. I am always the well-informed one, doing research til I am blue in the face. 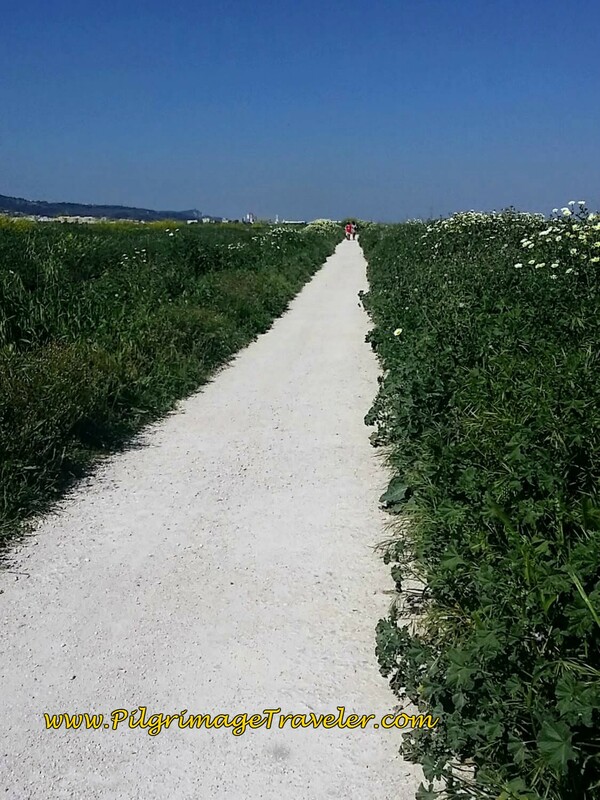 This trip, I took more of a "the Camino will provide" approach, and yes, even though the Camino did provide, I could have saved myself some heartache and body aches. The other lesson learned, is that I really can't do it all and be all things for all people. It seemed that not only was I carrying the responsibility for a smooth journey for my husband and I, now I seemed to have inherited another responsibility in our Swiss friend. How would this second guest's arrival serve me in the coming days? Seemed like in only one day, we were hooked up together. I could tell there were more lessons coming and it was going to be interesting! I only hoped I would be up for the challenge. 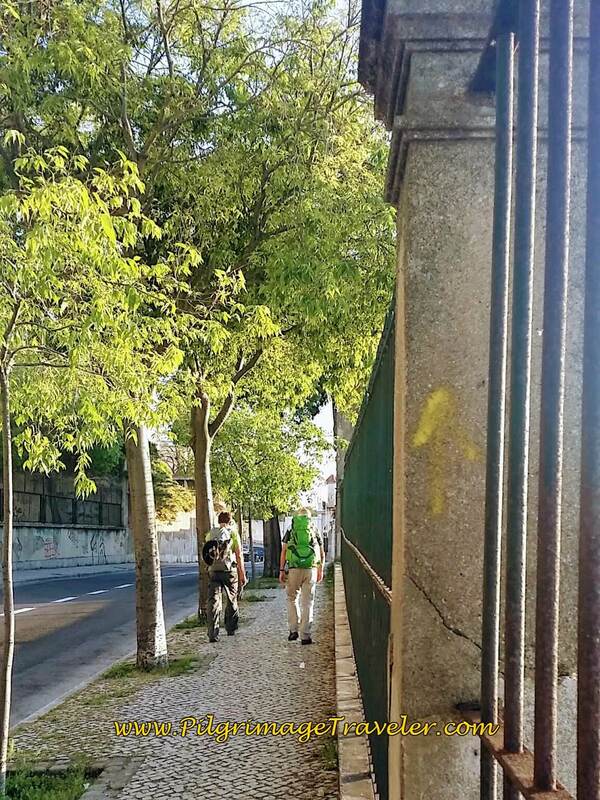 May your own day one on your Camino Portugués, be filled with adventure, discovery and guests invited and uninvited. May you greet each and every guest with the respect it deserves! Ultreia!